Hold the presses!! I found a bunch of old sketch books from years gone by this last weekend, while cleaning out the guest bedroom. This drawing is one of my favorites. Two kayakers, in a Topo-Duo, in a very UN-harmonious situation. Yes, dear reader, I draw from experience. Chris and I have paddled the Topo-Duo down just about every major river in the West, including Middle Fork Salmon, Main Fork Salmon, Colorado through the Grand Canyon, the Rogue, Deschutes, Umpqua, McKenzie, and I don't remember where else... 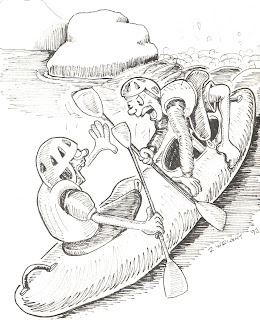 There have been times when I order us to paddle somewhere, and Chris has told me in no uncertain terms...."NO!" At one point, we were going to paddle back into a rapid to help out a raft that was lodged on a rock. As I paddled forward, Chris was paddling backward!! She wasn't going to have anything to do with that nonsense! That was the episode that spawned this drawing. I think I have learned over the years, that this is a team effort, and both parties need to be in agreement before anything gets done. At least I hope I have learned...maybe not...our latest adventure in the Topo was on the Rogue, and we ended up going over lower Grave Creek falls upside-down, dragging both our heads over the rocks; all because I thought I could make a spiffy move above the drop. I forgot to include Chris in this decision.